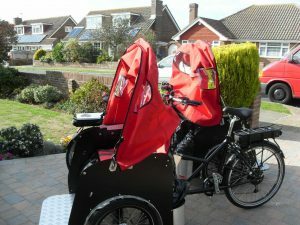 CWA Seaford Chapter launches its Trishaws on Sunday 7th October at 10 am. All are welcome to our launch event from 10am on Sunday 7th October at the west end of the promenade by the Sailing Club. A very short presentation of the trishaws will be given and then we will be giving short taster rides in our two new trishaws and answering any questions about the project. 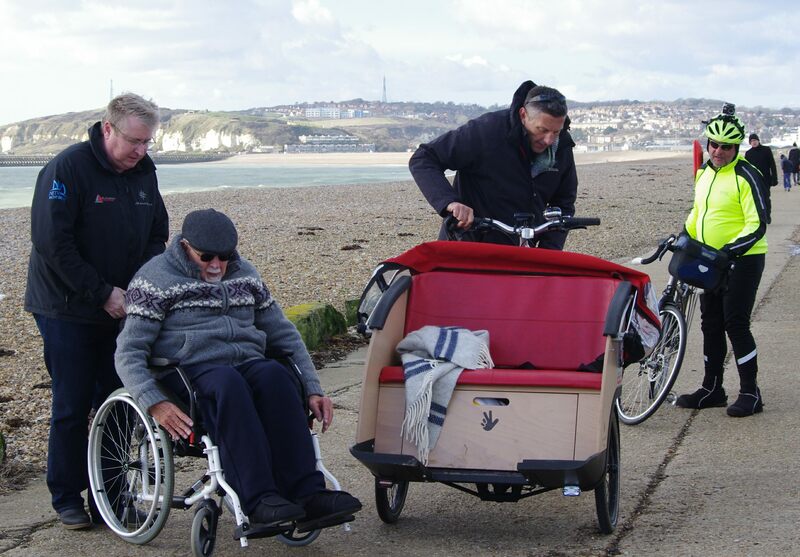 Following a vote at Cycle Seahaven’s recent AGM it was agreed that we would support Cycling Without Age – Seaford to raise awareness and funds to enable them to purchase the first Trishaw for Seaford. 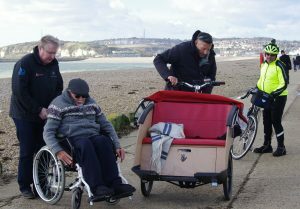 A fortunate visit to Cycling Without Age’s roadshow last Friday in Hassocks gave us a last minute chance to have a loan Trishaw called Annie for the week. Jumping at the chance to promote this amazing scheme Cycle Seahaven took delivery of the Trishaw on Saturday. Annie’s first rid e out was on Sunday where we spent 3 hours down at Seaford Seafront offering rides to passers by and also to our club riders to have a go at being the pilot (rider) as well as the passenger. Many were surprised and pleased to find that the bike is power assisted which makes it incredibly easy to ride with passengers up front. 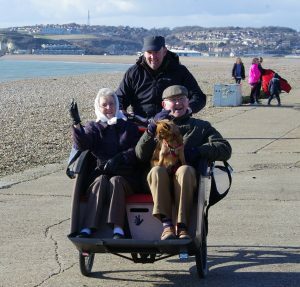 Our volunteer passengers commented on how comfortable the ride was and how fun it felt to be up front with the wind in their hair and the fantastic views along the seafront. It was also very noticeable the interaction between passengers and passers by who all wanted to wave and say hello. This being a key element of the scheme – getting people back outside and feeling part of their local community once more. A quick recharge overnight saw Annie refreshed and ready for another day on the seafront. Once again there was a fantastic response from the general public and from the press. Behind the scenes the club has worked very hard in a very short time to make new contacts for Pete Tattam (founder of Cycling Without Age – Seaford) and Mary Hawes (fundraiser) which has really kickstarted the fundraising and publicity. Sussex Express also contacted us after seeing the post on facebook and will be covering the story in this Friday’s edition. Seahaven FM also visited and taped some interviews and have been covering this on the radio all week. Both Pete and Mary commented that they are so grateful for the support shown by the Club and feel re-energised about their project. They are starting to believe that the purchase of a Trishaw this year may now be a real possibility. The Trishaw was also in Broad Street on Friday Morning after which she was invited to visit Old Ben Warden Assisted Homes in Seaford to give some of the residents a ride out.